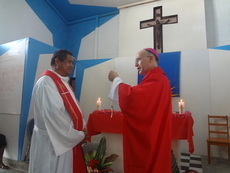 FR REYNALDO B. GETALADO, an MSP missionary to the Diocese of Bougainville (Papua New Guinea), was appointed by Pope Francis as the new Ecclesiastical Superior of the Mission Sui Iuris of Funafuti in the Pacific island of Tuvalu. His appointment was announced last February 24, 2014. Fr Getalado succeeded Fr John IIkataere Rarikin, MSC, who was appointed in September 2010 and died on February 8, 2014. Tuvalu, formerly known as Lagoon Islands or Ellice Islands, is a country in the Southwest Pacific, comprising of a group of nine coral islands. It was established as a British protectorate in 1892. From 1915 until 1975 the islands formed part of the British colony of the Gilbert and Ellice Islands. It achieved full independence in 1978. Tuvalu is now a member of the Commonwealth (formerly a special member not represented at all meetings, until 2000). Its languages are English and Tuvaluan. Majority of its population are Christians. Its currency is Australian dollar, though Tuvalu dollars are also used. Tuvalu’s capital is Funafuti. Its population is around 11 000. Its area spans 26 sq km (10 sq miles). Since his arrival at his new mission, Fr Getalado shared that he did not have a hard time adjusting to the people. The Tuvaluans are a good-natured and kind-hearted people. They are not aggressive in nature. They are courteous and will greet you when you meet them on the street. Catholics are a bit shy but are always ready to offer help to the priest.